With a stay at Intima Resort Tulum - Clothing Optional - Adults Only in Tulum (La Veleta), you'll be within a 15-minute drive of Cenote Crystal and Gran Cenote. The front desk is staffed during limited hours. A roundtrip airport shuttle is provided for a surcharge (available 24 hours), and free self parking is available onsite. A stay at Condo Tukano-40 Cañones places you in the heart of Mahahual, a 1-minute drive from Mahahual Beach and 5 minutes from Mahahual Lighthouse. The front desk is staffed during limited hours. 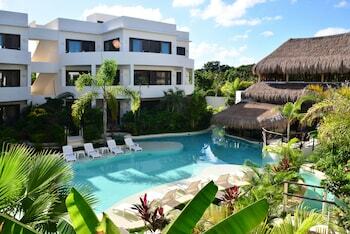 With a stay at this vacation home in Tulum (Tulum City-Centre), you'll be close to Temple of Doom and Tulum Mayan Ruins. Free self parking is available onsite.